So, a number of things have happened in the world of remote presence solutions — least of which one of our team has been quoted in a recent article in the Economist. Now, check out the quick rundown of interesting articles that have graced our inboxes. Telepresence robots: Your alter ego on wheels – one of our editors worked the The Economist in this story, breaking down the details behind the burgeoning remote presence market. 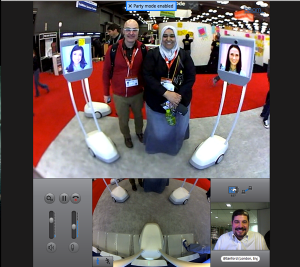 Robot Lets You Be in Two Places at Once (Discovery News) – Suitable Technologies decided to take their Beams to SxSW and had at least three booth Beams conversing with passer-bys during the Interaction event. And one of us got to pilot around the event and took some great photos. The technology, which the company refers to as remote presence, is designed to enable communication between people separated by distance but who also want more flexibility in sharing a physical space. “Video conferencing is cool, walking is cool, so together this is very cool,” said Suitable Technologies CEO Scott Hassan. In fact, Suitable Technologies sees its competition as face-to-face interactions rather than other teleconferencing services such as Skype. “With a video conference you’re stuck on the wall, but this is mobile,” Hassan said. vGo has been getting a great deal of milage out of their Verizon commercial and showing how the friendly solution can help students in schools in places like Wauwatosa, Wisconsin, West Seneca, New York and Knox City, Texas. This entry was posted in Anybots, Anybots QB, Beam, Remote Presence News, Remote Presence Systems, Suitable Technologies, VGo, VGo Communications and tagged Anybots, Beam, remote presence systems, Suitable Technologies, telepresence robots. Bookmark the permalink.